Raise the roof with this qualified lead list of disc jockeys! Share the sweet sounds of your product or service to a wide group of individual entrepreneurs. Our DJ email list contains the contacts you need to throw an amazing B2B marketing party. Whether they're rocking with mixers and turntables or the newest tools and software in digital audio technology, DJs need an assortment of high-quality products, software solutions, and services to help them keep the party going. 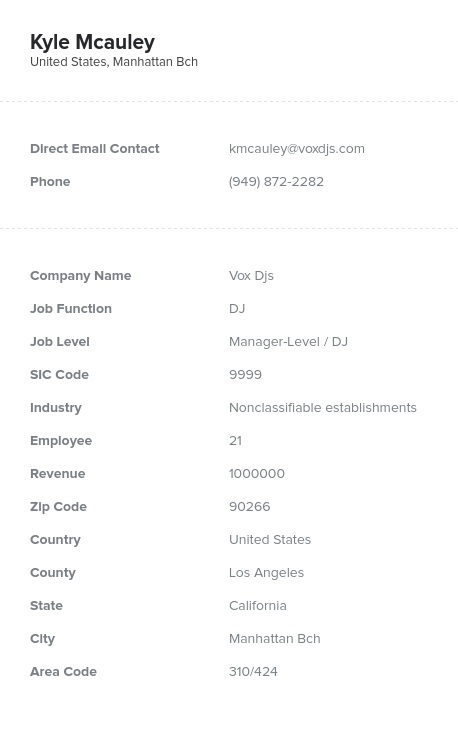 This highly qualified, human-verified disc jockey email database can help you reach out to these party professionals and business owners. You can buy and use our B2B email list whether you're selling a speaker system, showing off a booking app, or trying to offer a unique service to individual music producers. It's not always beats, demos, and mixes, and DJs can require a vast array of tools to help them make their businesses more successful. Let them know that you can take care of some of the difficulties so that they can do what they do best. Buy our professional DJ mailing list and start connecting with them in whatever way is most convenient; we've included their emails, phone numbers, company information, and names. An email database of DJs is a valuable tool for those looking to do B2B outreach with very small businesses. As far as sales leads go, DJs are often a more laid-back group, but they need powerful tools to craft an amazing music experience. Let them know you want to rock out with them and connect with professional musical leads today!